Need to create a coupon now? Click here to get started. To access your list of coupons, visit the Manage section and click the Coupons button. Check the boxes for any coupons you wish to apply to the same event(s). 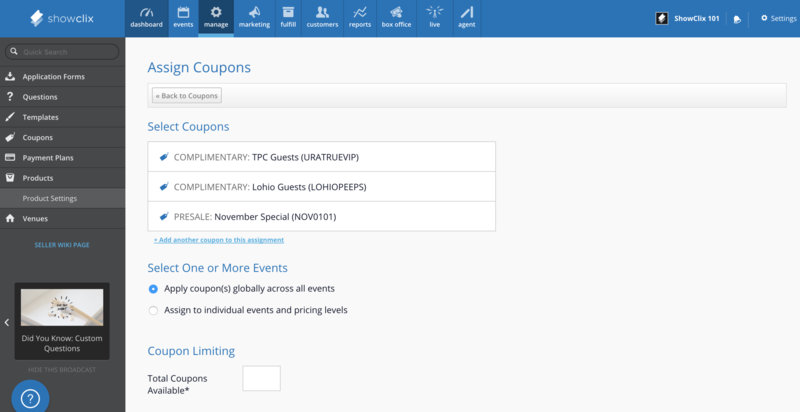 Press the assign coupons button to assign your selected coupons to events of your choice. On the Coupon Assignment page, you'll notice the coupons you selected from the previous page. To add additional coupons, click the Add an additional coupon link. Next, you'll need to select how to assign these coupons. You have two primary options: assigning per event or price level, and global assignment. Assign to Individual Events and Price Levels. Click this option and click Add Events to open the event selection menu. From this menu, select the events and price levels for which you want to assign these coupons. Assign Coupon(s) Globally Across All Events. Click this option to apply the selected coupons to every event in your account. Please note that this includes all upcoming events as well as past events. Adjust these settings to apply to every selected coupon. Ticket Limit. Enter the number of times the coupon(s) can be used in this particular assignment context (e.g., each coupon may be valid 50 times on a VIP price level). Taggable. Select whether the coupon(s) can be used as a tracking tags. Start / End Date. Determine the time frame in which the coupon will be valid. From the main Coupons menu, you can view details for all of your coupons. Click Export CSV to download a report of basic information for all coupons, including the type, code and a discount amount. Click the pencil icon to quickly access the Edit menu for any coupon on the list, or click the X icon to delete a coupon and instantly remove it from all assignments. Coupon Usage Reporting per Assignment. You can access this report from the main Coupons menu. Click the [#] Assignment(s) link for a particular coupon to view the events or price levels for which the coupon has been assigned. Then, click Uses For This Offer to download a report of all information regarding the particular coupon assignment. Coupon Usage Reporting per Event. For this report, you will need to navigate to the Event Dashboard for the selected event. Scroll to the Coupons section near the bottom of the dashboard, and click [#] Assignments for This Event to view all coupons for this event. Then, you can click All Coupon Usage to export a list of sales that used a coupon for this event, or you can click Export Usage to download a report filtered by event and a selected date range.